Six former high-ranking officials of the Guyana Rice Development Board (GRDB) who were slapped with fraud-related charges and placed on $500,000 bail each for failing to make a proper entry into a register of a company with the intent to defraud $362M from the entity’s Republic Bank account, yesterday made another appearance in the Georgetown Magistrates’ Courts. Chief Magistrate Ann McLennan re-read the charges to the six accused and they all pleaded not guilty. The defendants will now have to face trial in the Magistrates’ Courts after the indictable charges were changed to summary charges. 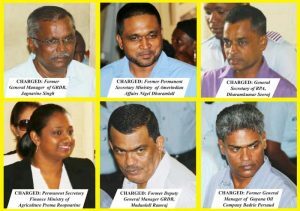 The six officials charged are former General Manager of the Guyana Rice Development Board (GRDB) Jagnarine Singh; former Deputy General of GRDB and People’s Progressive Party Civic (PPP/C) Member Madanlall Ramraj; General Secretary of the Producers Association (RPA) and PPP/C Member of Parliament, Dharamkumar Seeraj; former Permanent Secretary of Ministry of Amerindian Affairs and PPP/C Member of Parliament, Nigel Dharamlall; former General Manager of the Guyana Oil Company Badrie Persaud and the Deputy Permanent Secretary Finance Ministry of Agriculture, Prema Roopnarine. The accused all pleaded not guilty to the charges which alleged that between January 1and December 31, 2012, with intent to defraud, they omitted or concurred to be omitted $77.3M from the general ledger of the GRDB’s Republic Bank account. Similarly, between January 1 and December 31 of the years 2013, 2014 and 2015 with intent to defraud the entity, they omitted or concurred to be omitted from the said Republic Bank account, $9.7M, $130M and $145M for three respective years. GRDB is the authority charged with overseeing the rice industry throughout the country. Attorney-at-Law Glenn Hanoman asked that his clients’ passports be returned to them, citing that his clients are all representatives of the Rice Producers Association, and are required to travel overseas in order to seek markets for rice. Hanoman further told the court that the trial will take a long time and withholding his clients’ passports is affecting them. Former Attorney General Anil Nandlall, who is representing Seeraj, told the court that from the beginning of the investigation his client has fully cooperated with the police. He went on to state that his client has constitutional rights to leave the country. Nandlall asked why only six members from the 15-member board were charged, and said that his instruction has led him to conclude that the remaining members should be investigated. Nandlall opined that the charges are selective and vindictive. Special Prosecutor Michael Somersall had no objection to the application made by the attorneys but told the court that if any of the defendants fails to turn up to court when the matter is called, certain applications will be made. On their first appearance, the six GRDB members were all ordered to lodge their passports with the police and report to the Special Organised Crime Unit (SOCU), but yesterday their passports were returned to them. The matter was adjourned until July 11 when the defendants are expected to be served with statements.